It is remarkable that the tiny principality of Monaco not only has been able to produce the most well-known race in the Grand Prix series but also one of the most legendary racing drivers the world has known, a driver with a career spanning 35 years, a driver who won the French Grand Prix four times, and included a multitude of victories comparable only to the great Nuvolari. Louis Chiron was born in 1899 in Monaco by French parents. Holding dual citizenship Chiron joined the French army during WW1 starting off as an artillery man. He must have shown his natural talent as driver early because at an age of 19 he had already advanced to being chauffeur to Maréchal Ferdinand Foch, commander in chief of the Western Front. In the early 1920s he was back home "working in the Hôtel de Paris in Monte Carlo", as you can read in the history books, a prudish way to announce the fact that the young and good-looking Monegasque, the embodiment of Gallic charm and grace, was now earning his living as a "dancing partner" for rich ladies. The fact is that rich ladies in the old days in several cases were to play the part as "sponsors" for those racing drivers who weren't fortunate to have been born with blue blood in their veins or have a millionaire as their father. Chiron started his career as racing driver in 1923 driving a Brescia Bugatti in local events. Later this was changed to a T35 Bugatti. In 1926 Chiron met a young German driver that would become one of his closest friends, Rudi Caracciola. That year he also met Alfred Hoffman, heir to the famous Hoffman-La Roche pharmaceutical company. The rich Hoffman was interested in car racing and as he also owned the Nerka spark plug company, so he decided to sponsor a Bugatti with Chiron as driver. So Chiron went out and bought the first supercharged 2.3 litre T35B that the Bugatti factory produced and now the results started to come in fast. Chiron made his Grand Prix debut at the 1927 Spanish Grand Prix racing in second position before being forced to retire. He then finished fourth behind the Delages at the English GP. In 1928 he shared his time between driving for Hoffman and the Bugatti works team. The first great victory came at the Gran Premio de San Sebastian at the Lasarte track in July 1928. It was followed up with victories at the Spanish Grand Prix at the same track, the Antibes GP, the Marne GP and the Rome GP but his greatest victory of the year was at the European Grand Prix at Monza where he beat the three musketeers Varzi, Campari and Nuvolari and established himself as one of the top Grand Prix drivers in Europe. He also went to Indianapolis that year with a Delage, finishing 7th after a lengthy pit stop. Alfred Hoffman had a beautiful wife named Alice Hoffman-Trobeck but known to all just as "Baby". Born in America with a Swedish/German father and Norwegian mother and living in central Europe she was bright-minded, urbane and fluent in several languages and proved later to be a great access to the Mercedes-Benz team as an interpreter and timekeeper. As a racing enthusiast herself she began to travel to all the races as a timekeeper for Chiron and soon it became an open secret to all but her husband that her interest in that driver wasn't just restricted to time keeping. In 1929 Chiron won the German and the Spanish Grands Prix. That year he would also forever change the history of Grand Prix racing as he in association with Anthony Noghès gave the GP calendar its most glamorous event, the Monaco GP. The following year he won the Belgian GP but the rest of the season was disappointing. Racing a Bugatti T51 in 1931 he added the Monaco, French and Czech GPs to his list of victories and the year after the Dieppe, Czech and Nice GP were also added. Finally the Chiron-Alice bubble burst and an angry Hoffman sacked Chiron and replaced him with René Dreyfus. Alice's marriage to Alfred Hoffman had been a joke for a considerable time so she decided to divorce her husband and instead join Chiron on his trips across Europe. For those who think this kind of driver/team boss' wife intrigue is restricted to the pre-war era: please wake up to the rumours that a similar situation was one of the reasons that a French driver even more famous than Chiron got sacked from a major F1 team more than 50 years later. Talking of sacking, at the end of the 1932 season Chiron was fired by Bugatti after team manager Meo Constantini had had enough of Chiron ignoring his orders. Chiron and Caracciola therefore decided to create their own team sharing expenses and profits fifty-fifty. So in early 1933 the newly established Scuderia CC had bought three Alfa Romeo P3s and a couple of Bugattis and painted them in team colors, white with a blue stripe for Caracciola and blue with a white stripe for Chiron. The team made its debut at the 1933 Monaco GP but during the practice Caracciola had a serious accident at the Tabac curve that put him out of GP racing for over a year. When Caracciola's wife also died in a ski accident the driver fell into deep depression and it was only because of the tremendous effort of Louis and "Baby" that he was able to rally and make a comeback as Grand Prix racer. Chiron then joined Scuderia Ferrari for the rest of the season winning the Spanish, Marseilles and Czech GPs and, together with Chinetti, the Spa 24h race. For 1934 Ferrari had a very able team line-up including Louis Chiron, Achille Varzi, Count Trossi, Guy Moll and Marcel Lehoux to race the new improved 2.9 litre variant of their Tipo B monopostos. In the first race of the season at Monaco the Ferrari drivers finished 1-2-4-6. Chiron had almost a one-lap lead with just two laps to go when he made a mistake and ran into the sandbags at the Station hairpin, finally finishing second, with Moll taking the victory. Chiron was also second at the Bordino GP, this time to his team mate Varzi, and third at Tripoli behind both Varzi and Moll. He finally took his first victory of the year at Casablanca. He then retired at Avus and finished third at Eifelrennen behind the new German teams. At the Penya Rhin GP Chiron was second to Varzi and took fastest lap. The grid positions were drawn by ballot and Chiron found himself on the third row. From there he made a fantastic start as the flag dropped (or possibly even before it dropped - look at our picture to see the progress he made) to take the lead followed by Caracciola (Mercedes-Benz), Fagioli (Mercedes-Benz) and Stuck (Auto Union). Then the Germans started to attack. Stuck passed the Mercedes cars and took his Auto Union up into the lead from Chiron on the third lap. Fagioli passed Caracciola and began to close in on the Alfa Romeo, breaking the lap record during the charge. One after another the German cars struck trouble. Momberger was the first to give up, then von Brauchitsch and then Stuck started to struggle and Chiron was back in the lead with Stuck falling back behind him and the two Mercedes cars. Caracciola and Fagioli now had a tremendous fight for positions while chasing Chiron. The internal Mercedes duel ended in a draw, as both drivers had to retire, Caracciola with fuel feed problems and Fagioli with a broken brake pipe after having run off the road in his fight for the lead. The race situation had altered completely. The only German car left was Stuck's clearly struggling Auto Union, and Chiron, who had done an incredible race so far to the cheer of the spectators, could ease up a bit. At half distance the Alfa Romeo cars went in for refuelling and tyre changes. Varzi held the lead for a moment during the pit stops but then it was Chiron again at the top position. The Ferrari drivers Chiron, Varzi and Moll, who had taken over from Trossi, now held full command of the race with Stuck at a distant fourth position. The rest of the race was just a Scuderia Ferrari parade, Chiron taking the flag to an enormous popular victory. The German teams had suffered a humiliating defeat and there were those who believed that the fears about the future had been exaggerated. Perhaps they weren't that competitive after all! From then on however his career took a deep dive. The Ferrari Alfa Romeos were no match for the German cars and in 1935 Chiron's only victory came in the minor Lorraine GP. In 1936 Chiron had the bad fortune to join his friend Caracciola at the Mercedes-Benz team at exactly the wrong moment. He took pole at Monaco in his first race for the team but the cars proved to be uncompetitive and Chiron's best result that year was a miserable 6th and after a serious high-speed crash at the German Grand Prix when the car spun to the left and overturned Chiron was sent to hospital with wounds on his head and shoulders. He decided to retire from Grand Prix racing. "Baby" Hoffman-Trobeck had asked Chiron several times to marry her but Louis had not been that interested, preferring things to stay the way they were. Therefore, when Caracciola asked "Baby" to marry him she did not hesitate to say yes. When Chiron heared the news he was furious, but he knew he had only himself to blame. The cunning Anthony Lago saw his opportunity and lured the still choked Chiron out of retirement just a few days later. The result was a victory at the French GP, run that year to the sportscar formula, in a Talbot T150C. In 1938 he tried a Delahaye at Le Mans before he again retired to his native Monaco. After the war Chiron made a comeback, racing for Talbot in 1946-49 and Maserati in 1950-'51, his last victory being at the 1949 French GP, when he brought the Talbot-Lago to a surprise win against the faster opposition. He retired yet again in 1956 after a class win in the Mille Miglia and thereafter Chiron concentrated his efforts as Commissaire General to organize and arrange the Monaco GP and the Monte Carlo Rally. He made a guest appearance as late as 1971 as the starter to the Monaco GP to celebrate his victory 40 years earlier. It is said that before a race Chiron would stroke the car and talk to it as if it was a horse. His love of cars and the sport is clear to see. To the fans he became known as Le Vieux Renard (The Old Fox). He was known for his faultless appearance that included a light blue racing suit and a polka-dot neckerchief. His style in the car matched that of his looks. Throughout his career he had a reputation for his elegant and clean driving style. One of the great characters of Grand Prix racing, Louis Chiron, the Alain Prost of the pre-war era will forever be a part of racing history. The picture we are looking at shows Louis Chiron's famous take off at the 1934 French Grand Prix from the third row as he had jumped the start. He had passed Caracciola, Momberger, Varzi and Stuck ahead of him and at the fall of the flag he was in the lead. Try to repeat that now, 66 years later! Louis Chiron's grandfather had a winery in the Provence and occasionally the winegrower Chiron drove with his son to Monte Carlo to sell his good wine to the fine hotels at the Riviera. This son, the father of the racing driver, was impressed and attracted by the world of luxury and moved to Monte Carlo to work in a hotel. He started at the bottom, worked his way up in the hotel industry, went to London and Germany to further his education and finally became Maître d' at the very elegant Hotel de Paris in Monaco. Louis Alexandre Chiron was born on 3. August 1899 in Monte Carlo in the Principality of Monaco. Since his father was still a French citizen, Louis had also the right to French citizenship. At the age of 15 and as son of the Maître d', Louis began as bellboy, clerk and jack-of-all-trades. At the onset of the Great War in 1914 his father was drafted. His mother had died early and a Russian princess now took him into her Villa in Monte Carlo. Not only did he work there as a servant but he also learned languages, was taught conversation and etiquette and with 16 the chauffeur gave Louis driving lessons. Eventually the princess drove only with Louis, who stayed with her until after he became 18. He was Monaco citizen and as such did not have to join the French army, but on 18. January 1918, at the end of the Great War, Louis Chiron voluntary joined and was serving in the 85th Artillery regiment in Dijon. His driving talent was soon recognized and he was sent to the army headquarter where he was driver for Marshall Petain and Marshall Foch, the highest officers in the general staff. After the end of the war he stayed on with the French Army for three years. At that time the army sold their surplus cars and Louis had the right connections as middleman. At headquarters he had also become acquainted with an Englishman, Captain William Grover, the later racing driver, with whom he started their trade with surplus cars at the Riviera in Nice. Ernest Friderich, a former co-worker, racing driver and friend of Ettore Bugatti, had established a Bugatti dealership 1923 in Nice and brought Louis in contact with Bugatti. When the surplus auto trade had come to an end, the Bugatti factory employed Chiron as driver to transfer new cars on road from Molsheim to Nice. Louis had to do a lot of driving all year long because many Bugattis were sold at the Riviera. Consequently, Chiron perfected his driving skills and later bought a 1500cc Bugatti Brescia from Ernest Friderich. Louis was also employed as a dancer, a respectable job, at the Hotel de Paris where his father was Maître d'. There he met an American lady who sponsored his early driving. He participated at several mountain climbs organized by the Moto Club de Nice and according to W.F. Bradley he did so as early as 1923. Chiron's first win came at the Barbonnet Mountain Climb, with a Bugatti in November 1924. From 1926 on, he changed to a Type 35 and started to make a name for himself. Like most drivers he began as privateer but from the 1927 British Grand Prix on he drove for the Bugatti factory till the end of 1932 after he had brought numerous victories to Molsheim. Although he had driven many other makes later on, no driver was so closely connected with Bugatti as Louis Chiron. In 1933, Chiron formed a private team with his friend Caracciola, when they purchased two Alfas and the following year he drove a factory Alfa Romeo for the Scuderia Ferrari. The 1934 French Grand Prix has been retold innumerable times for several reasons. It was still considered the most important event of the season. Then it was a race everybody had been looking forward to, since it was the first major clash of the new 750 kg formula cars with all factory teams finally present. The new German cars from Mercedes-Benz and Auto Union were facing the full might of the already established opponents Alfa Romeo, Bugatti and Maserati. The Type B Alfa Romeos came with 2.9-liter, 8-cylinder engines, delivering 255 hp at 5400 rpm. The Bugatti T59 had a 3.3-liter, 8-cylinder engine producing 240 hp at 5400 rpm and the Maserati 6C-34 had a 3.7-liter, 6-cylinder engine generating 260 hp at 5300 rpm. Against these proven cars, which had already won several races, were pitched the new designs from Germany. Daimler-Benz had already a very long history in racing. After committing themselves for years to sports car racing, which was very popular in Germany, they designed a new grand prix car. Their Mercedes-Benz W25 came with a 3.4-liter, 8-cylinder engine, delivering 354 hp at 5800 rpm. Not just produced it almost 100 hp more than the foreign opposition, but all wheels where independently suspended, the new way to go. The other German car came from Auto Union and was a revolutionary, strange looking machine. In the back, between driver and rear axle was its 4.4-liter, V16-cylinder engine, producing 295 hp at a low 4500 rpm. The car also had independent suspension all around. What was also of importance was the fact that the newly established Nazi Government subsidized both German teams and the factories had bigger budgets for their racing departments than their opposition. The French government had tried a similar route with the SEFAC car, which was entered here for the first time with Raymond Sommer as the nominated driver. But the car did not appear and for many reasons this project was condemned to failure. The fastest cars and drivers of the day were to fight over 40 laps on the 12.500 km long ten-year-old Montlhéry circuit, a total of exactly 500.000 km. 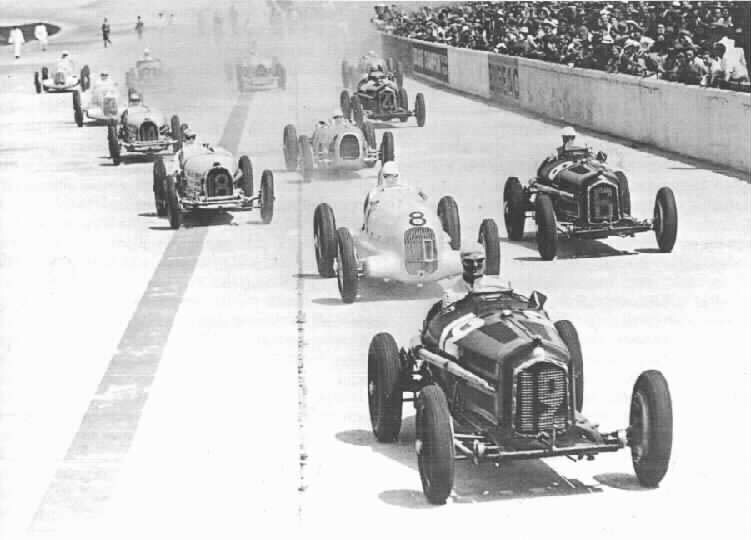 The entry consisted of 16 cars, but since three of them did not make the start, only 13 drivers lined up on the starting grid, which was arranged by ballot. The teams drew lots and then the team managers usually assigned their best drivers to the front positions. This old-fashioned arrangement was still customary in 1934 but already in previous year's Monaco GP, for the first time, the starting line-up had been arranged according to practice times. Not until 1935 would the headstrong A.C.F. yield to this new practice and drop their old grid arrangement by ballot. On the first day in July, a blazing hot day, an estimated large crowd of 80,000 lined the Montlhéry circuit and the main grandstand was filled for the first time. At two o'clock Louis Chiron made probably one of his most famous jumpstarts at this 1934 French Grand Prix from the third row. He blatantly passed Caracciola, Momberger, Varzi and Stuck ahead of him and exactly at the fall of the flag he had snatched the lead. He held first place until lap four when Stuck's Auto Union passed him. The German led Chiron's Alfa by 4,5 seconds, followed by Fagioli and Caracciola, both on the new Mercedes-Benz. This was Caracciola's first race appearance since his crash at Monaco in 1933 where he had received severe injuries to his leg. Stuck led the French Grand Prix till lap ten, closely followed by Chiron's Alfa, then Caracciola and Fagioli both on Mercedes. Stuck then had to stop at the pits for fuel, tires and oil. That gave the lead back to Chiron, who established the fastest lap in 5m06s at 91.4 mph on lap 15. Varzi's Alfa Romeo was in second place, 1m18s behind with Hans Stuck third, 5m22s behind Chiron. By that time all German cars except Stuck's Auto Union were out of the race. The first to go had been Momberger's Auto Union after ten laps with broken shockabsorber, then von Brauchitsch the next lap with supercharger problems, followed after lap 14 by Fagioli with brake hose problems. Caracciola then retired the last Mercedes-Benz on lap 15 with transmission problems. At halftime by lap 20, Moll passed Stuck's Auto Union and Alfa Romeo now occupied the first three places. On lap 31, Stuck had stopped to have his water leak attended to. But the water pump was leaking so badly, that he parked the car on the following lap. Zehender's Maserati was next to retire on lap 33, whereas Étancelin's private Maserati had already disappeared after 11 laps. By that time most Bugattis were also gone; Dreyfus after 16 laps with supercharger problems and the Nuvolari/Wimille car was out after 17 laps with gearbox problems. After 3h39m14.6s, Chiron finished first, which was one of his greatest victories. The predominantly French crowd enthusiastically applauded their French Louis Chiron who won ahead of Varzi and Moll who shared Trossi's car. It was also the most overwhelming triumph of the Alfa Romeo B-Type's, the only official finishers. Robert Benoist in fourth place, already four laps behind in the misfiring Bugatti, was flagged off and did not count as finisher. On his last lap, not seen by the officials, Benoist had taken a short cut in the countryside of the circuit, which caused the timekeepers some confusion, as his last lap was unbelievably good. The speed of the new German cars had astonished everyone, although they had not yet shown the stamina needed for a long battle.